If you skipped part one, you really shouldn’t have. Catch up here: Part 1. 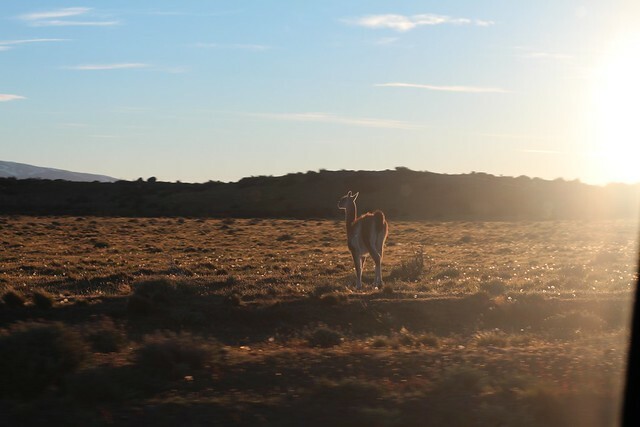 After our two nights in the Elqui Valley, we headed back to La Serena and flew down to Punta Arenas to begin the next phase of our adventure. 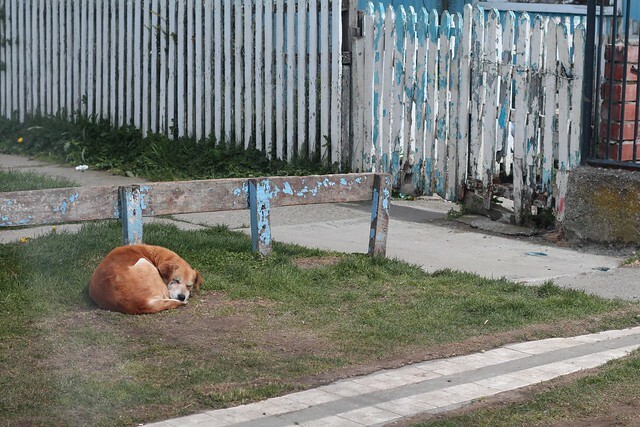 We got in fairly late that day and got to our hostel (Hostal Fitz Roy) in Punta Arenas. The hostel was alright; we had our own little 5-person cabin at the back of the property. It was cozy but it took us a while to figure out how the heat worked. 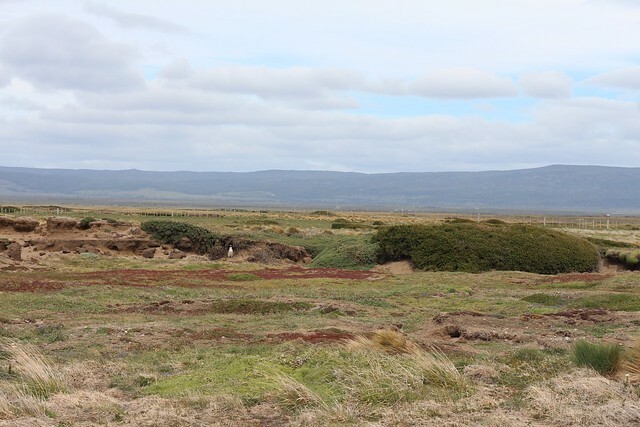 And, oh yeah, since we were in Punta Arenas now and basically as close to Antarctica as you can get without actually being in Antarctica, it was very cold even though it was spring (November). Breakfast at the hostel was typical chile: toast with jam, meat & cheese, tea or Nescafe “coffee”1, and some weird almost-orange juice. The next morning we picked up a rental car, found a grocery store (even though Google maps kept leading us in the wrong direction), and then finally got out of the city and began our multi-day adventure. 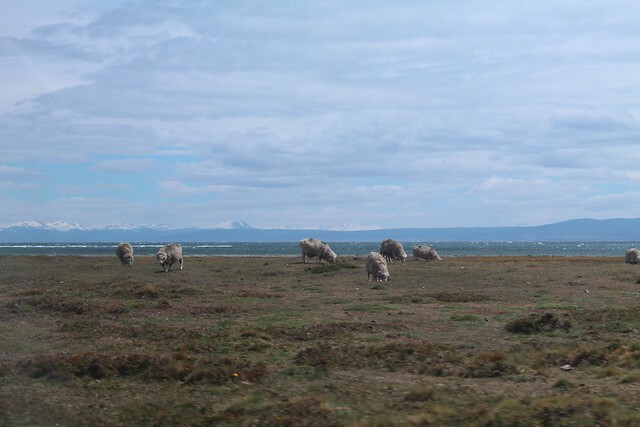 We drove along the Strait of Magellan on our way north to see a penguin colony and then to Puerto Natales and Torres del Paine national park. We went to Seno Otway penguin colony. 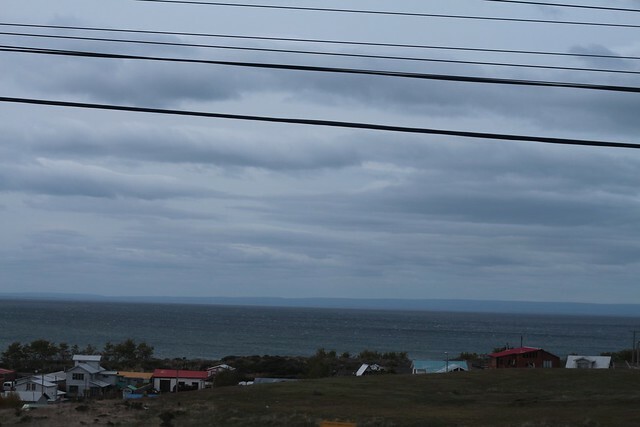 It took about an hour to get there from Punta Arenas and the signage was a bit sketchy. We saw a lot of sheep on the road on the way there. It was very cold when we finally got to the penguin colony. 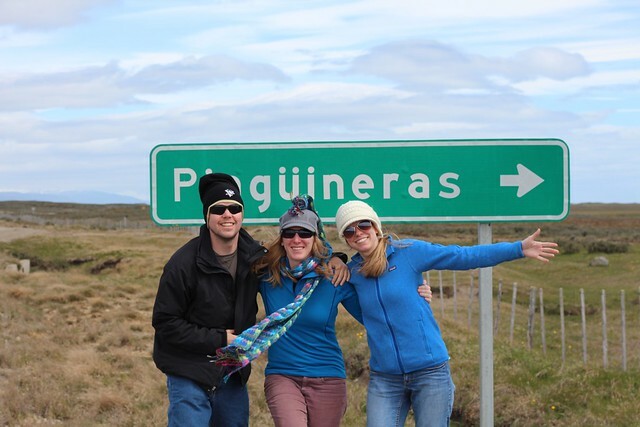 We didn’t see many penguins (pingüineras) – only about 30 or so in total while the colony supposedly had thousands of penguins. 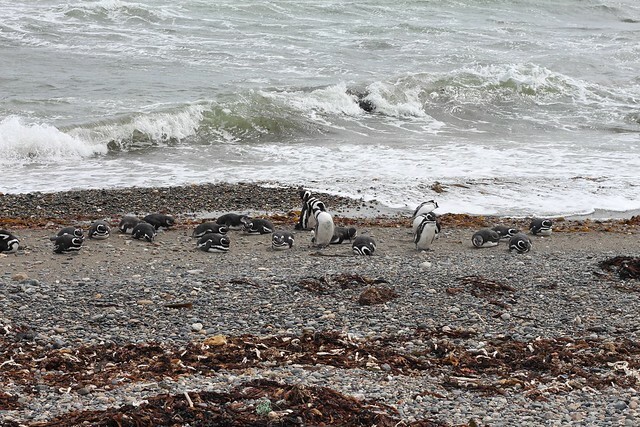 Most of the penguins we saw were on the beach just hanging out, but we saw a few hiding in the brush. They were pretty cute and it was cool to see them in their natural habitat. But it was basically the wrong time of year to see them. It was brooding season (this is the time after the baby penguins have hatched and the parents are being super protective or something) so most of the penguins were being secretive. 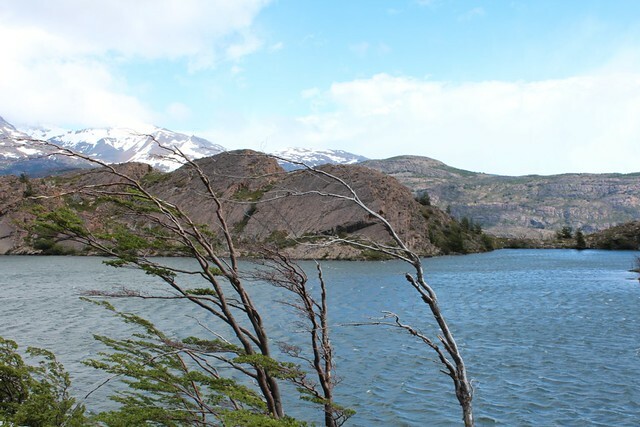 Puerto Natales is the small town a bit outside Torres del Paine national park, which is sort of the main tourist attraction of the area. Some people stay there before or after their camping and hiking trips in the park. We just stopped for gas on the way up to the park. 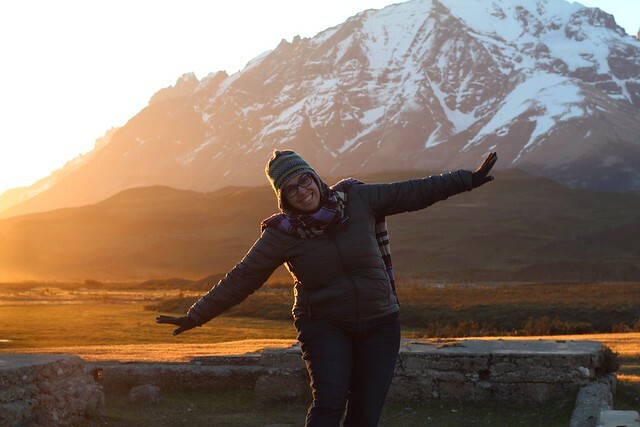 We stayed at a hostel in Laguna Amarga just outside the park that night. It took a lot longer to get there than we were anticipating, but we managed to arrive in time for dinner. It was a good hearty Chilean hiking meal. When we finished eating, the owner came in and said that he had spotted some pumas outside (it was now dark). So we got into the cars and went for a chase. Our car gave up after a while (and we kind of didn’t want to go off-road in the rental) and headed back. After about 30 minutes, the other car did end up seeing about five pumas. 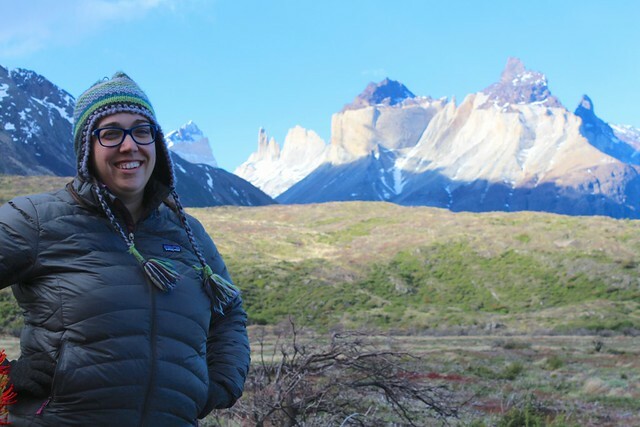 I ended up getting a bit more adventure than I bargained for at Torres del Paine, but overall it was a wonderful experience. 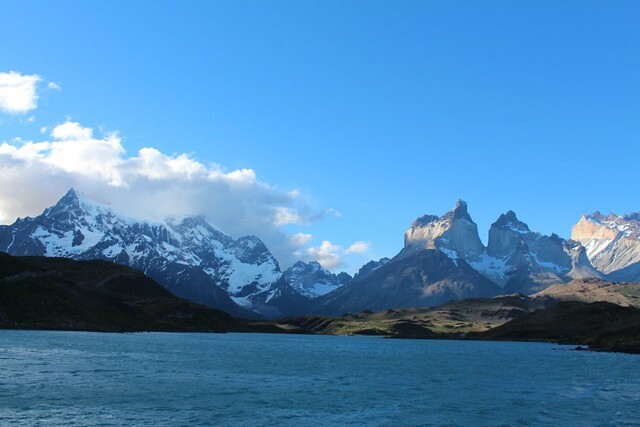 Torres del Paine (TdP) is a very well known national park, and for good reason. 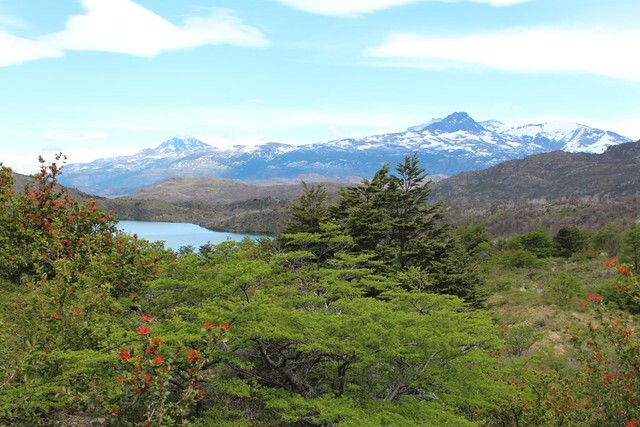 Not only is it extremely beautiful, but Chile has built up a wonderful infrastructure for hikers and backpackers. 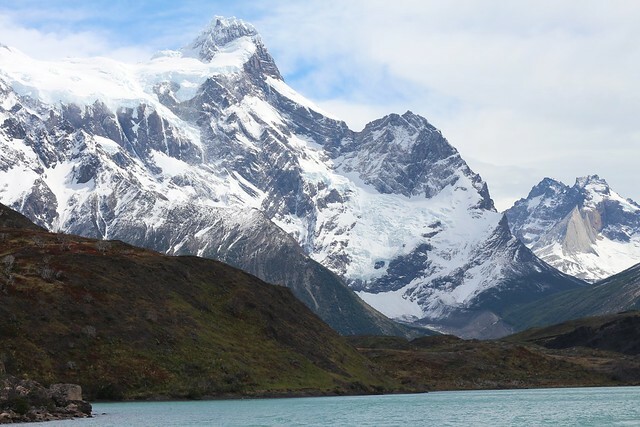 Most people visiting the park to do some backpacking will do the “W”, which is a W-shaped set of trails that lets you see most of the sites the park has to offer, including the towering torres the park is named for as well as mutiple glaciers. 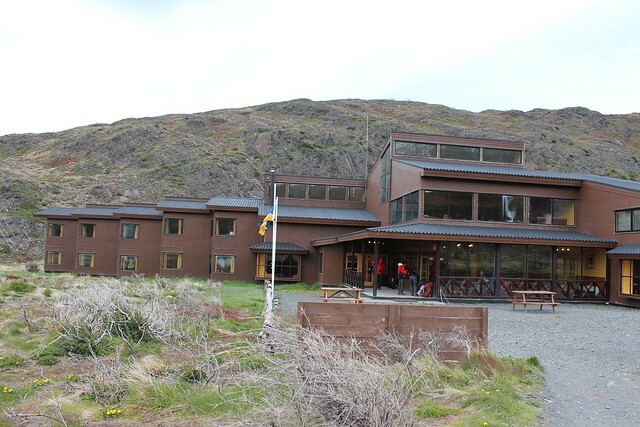 The park has refugios at each point in the W that offer hot food, drinks (some of them have bars), hostel-style beds, campsites, and a warm place to relax after a long day of hiking (one refugio even has a wood-fired jacuzzi). So you can hike for 4-5 days and end each day with a comfy bed, a shower, and a hot meal (or at the very least a campsite that is hot-meal adjacent). It’s really great. If you want to be even more adventurous you can do the whole park loop, but the back half of the loop has ony campsites so you’re on your own for that part. Due to the timing of my trip, I had only three days in the park, so I ended up doing half of the W, although as you’ll see, I kind of did that half twice. At this point in the trip, I split off from Katie and the others because I really wanted to see a different side of the park and do more hiking than the three of them. 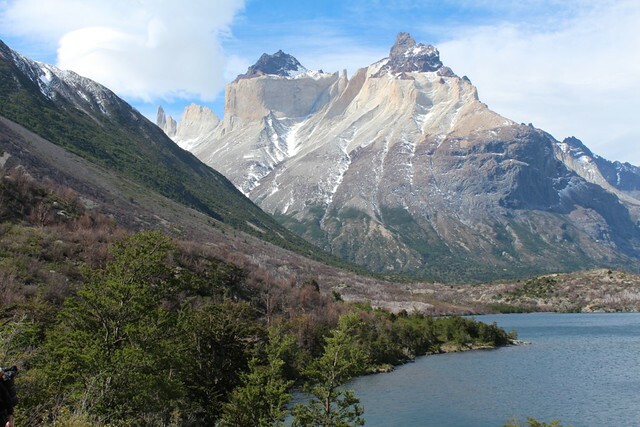 They did a day hike on the east side of TdP to see the torres (towers) and then drove around to the other side to see Lago Grey and the milodon cave. 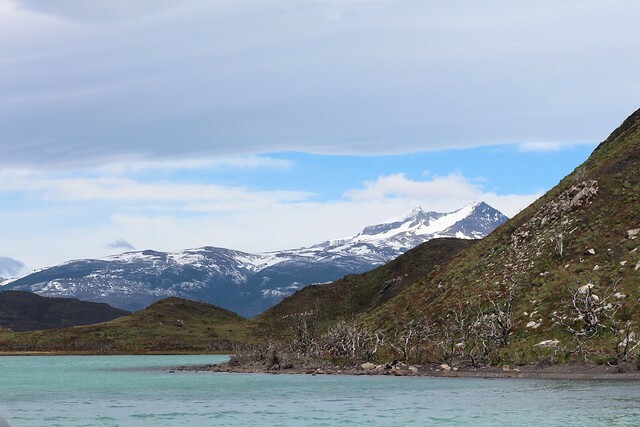 I took a bus over to Lago Pehoe and then a cataraman across the lake to the Paine Grande campsite area. I checked in to my room, dropped off my big backpack, and then did a half day hike over to the middle of the W and back. I didn’t get quite as far as I initially wanted to, because there were all these signs and warnings in the park guide about the trails closing around 6pm and I wanted to make sure to be back at my refugio before then (it turns out that no one was realy checking this and a ton of people came back to the refugio well after 7pm). 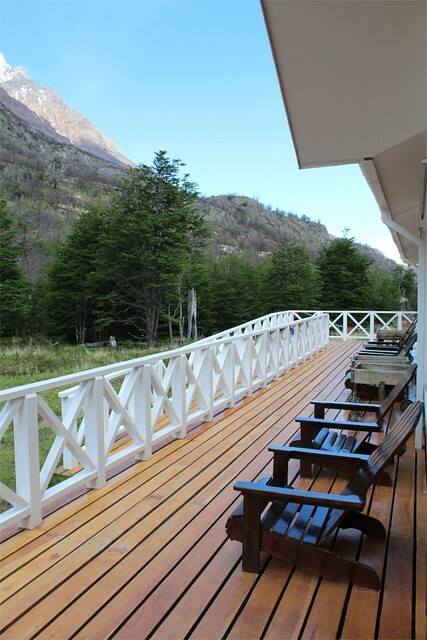 My room at Paine Grande had three bunk beds in it and so I had four roommates that night. Two of them were guys from the U.S. (I don’t remember where exactly) who were doing the whole W. They mentioned that it had snowed on the east side of the park on their first day. The other two roommates were two friends from Uruguay. They were both nurses there and although only one of them spoke English, we quickly realized that we all had the same itinerary for the next couple of days (including our flights out of Patagonia) and decided to team up. 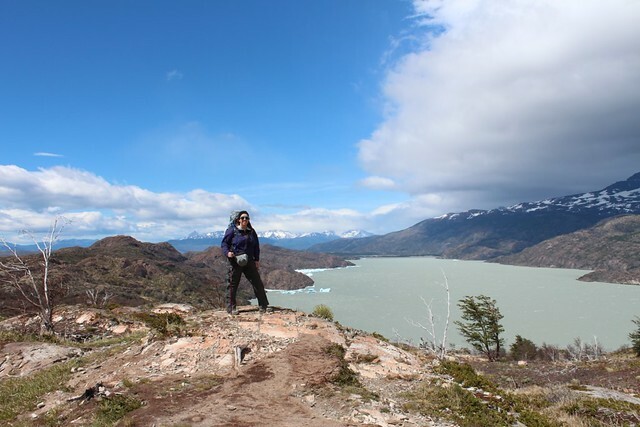 This was especially lucky for me for a number of reasons, but initially I was excited to a) have some companions on what was going to be a long hike the next day and b) one of them lent me one of her hiking poles which turned out to be extremely helpful. 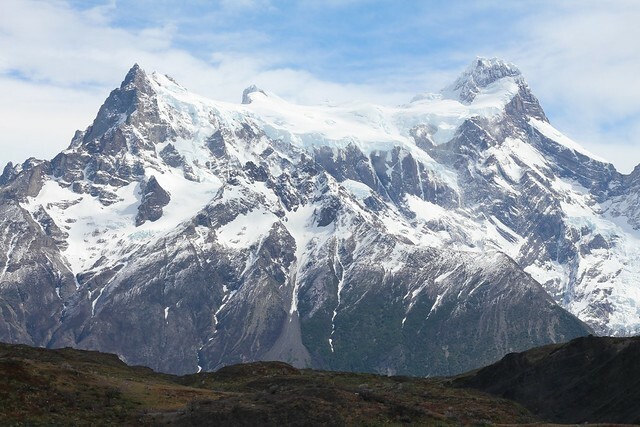 So the park guide said that this hike (from Paine Grande to Refugio Grey) was 11 km and would take about 4 hours. hahahahaha. Yeah, no. It was by far the hardest hike I’ve ever done, and that doesn’t even include the 20b pack I was carrying. It took 5.25 hours and my FitBit says it was about 9.5 miles (which is closer to 15 km). It was also extremely windy. My hiking companions were actually blown over. So yeah. I felt pretty dead after that and was soooo very happy to have access to a hot shower and a comfy bed. Also, seeing the glacier was totally worth it, so it was ok. The food at Refugio Grey was good. The common room was very cozy and it was really nice to sit and read a book there. 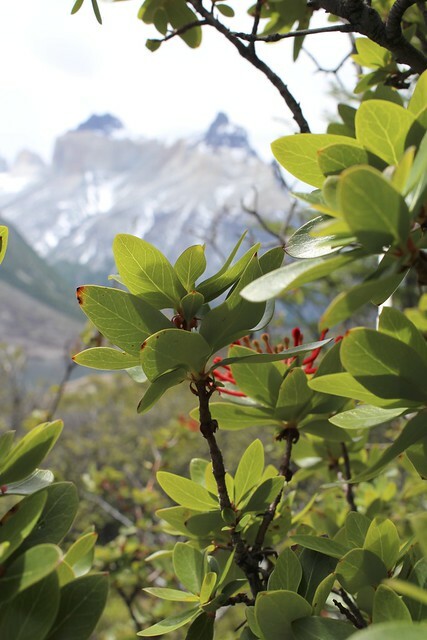 Paine Grande was ok, but there was really no comparison – this refugio was a lot nicer in every measurable way. At dinner I met a couple from New Hampshire and we talked about education stuff (he used to be a guidance counselor in an inner school in Boston). 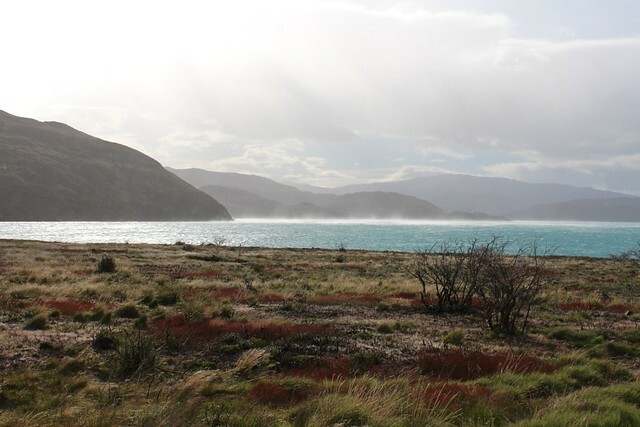 He mentioned that his reservation for the ferry the following day wasn’t good so I kind of freaked out, since I had made reservations on the ferry and then was going to take a bus back to Puerto Natales from the other end of Lago Grey. I double checked my reservation with the front desk and they said it was on so I went to bed not too worried about the next day. 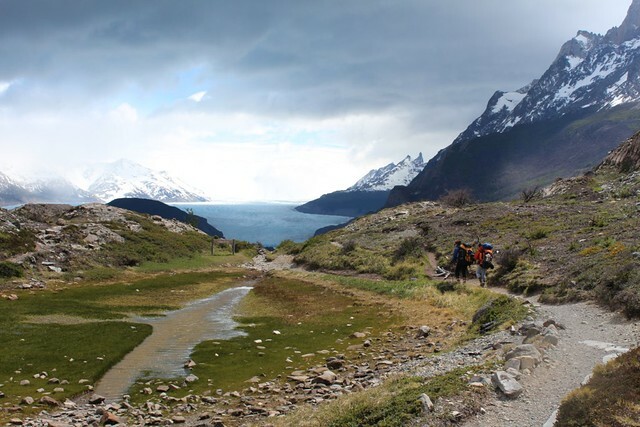 The next morning I found out that the ferry was being canceled due to extreme wind and I was going to have to hike all the way back to Paine Grande and take the catamaran again and a different bus if I wanted to get back to Puerto Natales. I totally freaked out because I really didn’t want to do that hike again. But I literally had no other choice. So I gave myself a big pep talk and put my hiking boots back on. Luckily the hike back was a lot easier – it only took about 4 hours. But my whole body was sore and I was still worried that I was going to miss my flight the following morning. But I made it back to Punta Arenas in time! 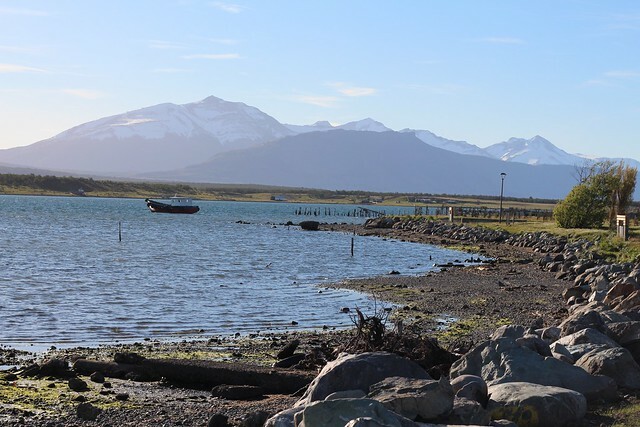 We took the catamaran back to Pudeto, fully expecting to get on a bus to Puerto Natales and hope for the best and figure things out when we got there (it would be too late for the last bus of the evening and the morning bus wouldn’t get us to the airport in time). But when we got off the catamaran there were two guys from the tour company with a sign for Lucia and Alicia (my new Uruguayan friends). 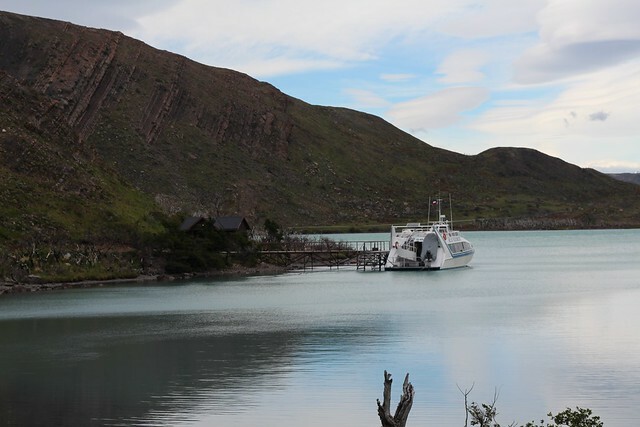 They had prepaid for the ferry that was canceled so the tour company was given them a private transfer to Puerto Natales. They checked and said that I could come with them. So I ditched the bus that I had paid for already (super fast crazy decision) and jumped in the car with them. It was very beautiful leaving the park. But there was a terrible bus vs van accident that occurred about an hour before we left due to the extreme wind. We passed the wreck as we left and it looked really bad. I saw in the local paper the next morning that three people had died and nine were injured. It was very scary. 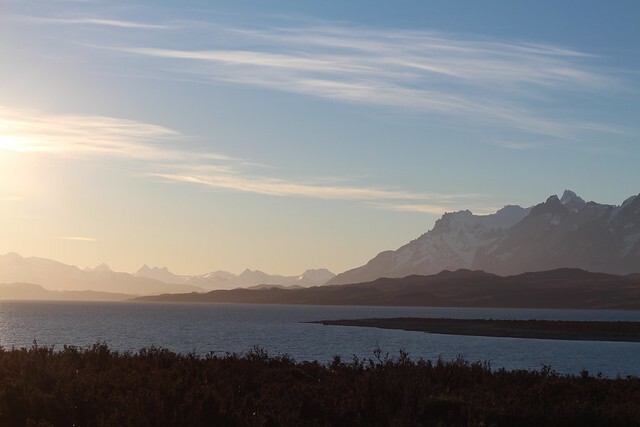 So we got to Puerto Natales in one piece and stopped at a pizza place for a quick dinner. 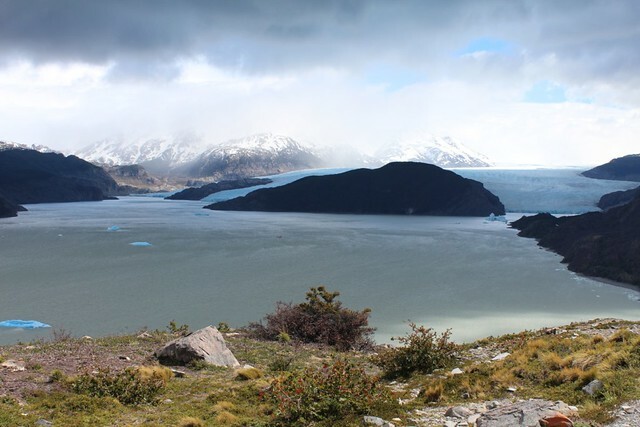 We then negotiated a bit to get a reasonable price for a transfer to Punta Arenas that night. And soon enough, we were on our way with the full moon by our side and Adele playing on the drivers’ iPhone. I’ll never forget that drive, knowing that somehow I avoided any major mishaps and was going to make it back in one piece and on time. We arrived back at the Hostal Fitz Roy around 1:30am which, all things considered, was not too bad. Sitting at breakfast the next morning I almost didn’t believe that it all worked out. And it wouldn’t have worked out so well if I hadn’t made friends with the Uruguayans.